Pac-Man is a game that started a revolution in arcade popularity. The addictively fun game, the loved Pac-Man character, and his evil ghost enemies has led to hundreds of variations of the Pac-Man game, and even Saturday morning cartoons dedicated to the power pellet eater. No one really had high hopes for Pac-Man, but they were oh so wrong. Pac-Man became so popular in Japan that for the second time in history the government had to mint more coins due to the Pac-Man coin consuming arcade games. In the early 80’s, arcades in every mall and town center would have at least several Pac-Man games. The phenomenon of arcades became so popular that the public began to spend time and money on a regular basis to get their entertainment fix by playing the nearest Pac-Man arcade. By 1981, the arcade game industry was fully functioning. Space invaders and asteroids were dominating the arcade scene and everyone wanted to test their skills in the local arcade. The infrastructure was there, as well as the customer base, everyone was looking for the next big game. The inventor of Pac-Man looked at a pizza with a slice missing and Pac-Man was born, or so the legend goes. Pac-Man was created by Midway at the same time of a Midway racing gaming called Rally X, and no one had hopes that Pac-Man would ever be as popular as Rally X. The Rally X game was thought to be the next big game for Midway, but Pac-Man was considered to be a novelty game that would never get any major popularity. 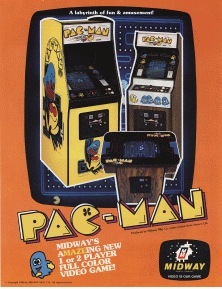 However, when Pac-Man was released it blew up the arcade scene and everyone wanted to play this game. It was like nothing anyone had ever played before. Although it was quite similar to the Rally X game, it featured original music and sound effects that just were not like anything anyone had ever played before. It was originally called Puckman, but they decided to change it to Pac-Man because of the possible misuses associated with a name like Puckman. 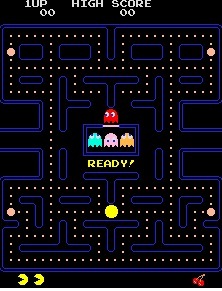 The game featured the character Pac-Man gobbling dots while being pursued through a maze by ghosts. The changes in color between levels would give a sense of progression and success as each level was defeated. This became the biggest arcade game of all time. During the 1980’s, you would see an entire wall dedicated to Pac-Man at arcades, and they would be filled with people standing in line waiting for a chance to play! This little yellow guy became the biggest star in the world! Pac-Man was being carried outside of arcades, and found in grocery stores, Seven Elevenâ? ?s, and even in private business break rooms. This was one of the only games that actually made it into cartoons, cereal, lunch boxes, watches, clothing, and bed comforters. This was the beginning of a path that was later followed by other games which made a rise to popularity. It was like a blockbuster movie that began to take over the world. Pac-Man caused arcades to become hangouts where teenagers and college kids would spend hours hanging out and having fun while playing Pac-Man. In 1981, America spent 20 billion quarters on arcades. The government actually stepped in to make hours reduced that arcades could stay open, and tried to set limits to how long customers could play on arcades. This caused a huge uproar. It suddenly became a status symbol of rebellion to play Pac-Man and other arcade games. In 1982, Ms. Pac-Man was invented, but it was created by college students and not the original inventor. The president of Midway actually purchased the add-on board created by the college students, but they were confused about what to name the game. It was first thought that Mrs. Pac-Man was a wrong name choice and it could be offensive to single women. So they decided to name her Ms. Pac-Man to appease any concerns with political correctness. Her fame blew up, but she soon faded and was considered to be basically the same level of popularity as Pac-Man. Pac-Man eventually became less popular and faded into history, because people that learned how to really play the game were able to master it. Eventually, they became so good they could play for an hour off one quarter. In addition, the home video game console exploded on to the scene, and this kept consumers in their homes and out of the arcades. People were so excited they preordered copies of Pac-Man from Atari, but Atari’s version of Pac-Man was a cheap knock off, and this was a major disappointment for some people. Yet, because they were playing it for free in their homes, people still loved the game! This began a market of knock off Pac-Man like games. Atari even defeated Magnavox in court over its knock of version. Baby Pac-Man, Super Pac-Man, and others eventually faded into history. Yet, there are still Pac-Man fans to this day, and they are still buying the latest console versions of the Pac-Man games. Pac-Man has been translated into action adventure games, RPG games, and just about every genre of gaming there is. In 1999, Pac-Man met Billy Mitchell, a man who owned his own hot sauce company. He walked into an arcade and played Pac-Man. Six hours later he played the entire game of Pac-Man, ate every power pellet, and actually beat the entire game! This was a record breaking feat, and it made him become a celebrity in the gaming community. There are very few gamers from the early 80’s that are still active in the gaming scene. Pac-Man has gone down in history as having made a mark on the 20th century. It is said that Pac-Man touched the lives of more people alive today than any other game in the history of mankind.